Some people, districts, textbooks (take your pick) teach multiplication and division together in one unit and at one time. I teach division after multiplication; after students have had some time working with multiplication, exploring equal groups, and building a deep understanding. I typically have introduced multiplication in October so I’ve used cheap spider rings as manipulatives to help students navigate equal groups. To see more about that introduction, click here to head to that post. This year, my district changed our curriculum maps so I was introducing multiplication in early September and the spider rings weren’t going to work. So I ran to the store and bought some Skittles because food is motivating for everyone. Lesson engagement was at an all time high so I knew I wanted to use them again when we started division. When I ran to the store, however, I had a great idea! We could use Twizzler’s Pull & Peels to show our equal groups! On Monday, to start our unit, I gave each student a Twizzler’s Pull & Peel and told them to start peeling apart each string. A couple of them broke when they pulled off the first couple, but I told them to not worry about it because we wouldn’t need them. While they were peeling, I walked around and distributed 24 Skittles to every student. Because I did it while the students were peeling, I didn’t count them all out ahead of time. By the time I was done passing out the Skittles, everyone was finishing up peeling. Teacher time saver. I explained to students that we were going to use our Skittles to help us understand division, and that they’d be surprised how easy it was for them to do. My kids this year psych themselves up when I introduce something new so I’m constantly looking for things to keep them engaged in that first lesson, and ways to keep them feeling successful using manipulatives they can use to navigate through the lesson. First, I told them to take their Twizzlers and make 3 groups by making 3 circles. Then, I told them to pick up 18 Skittles and put them into one hand. 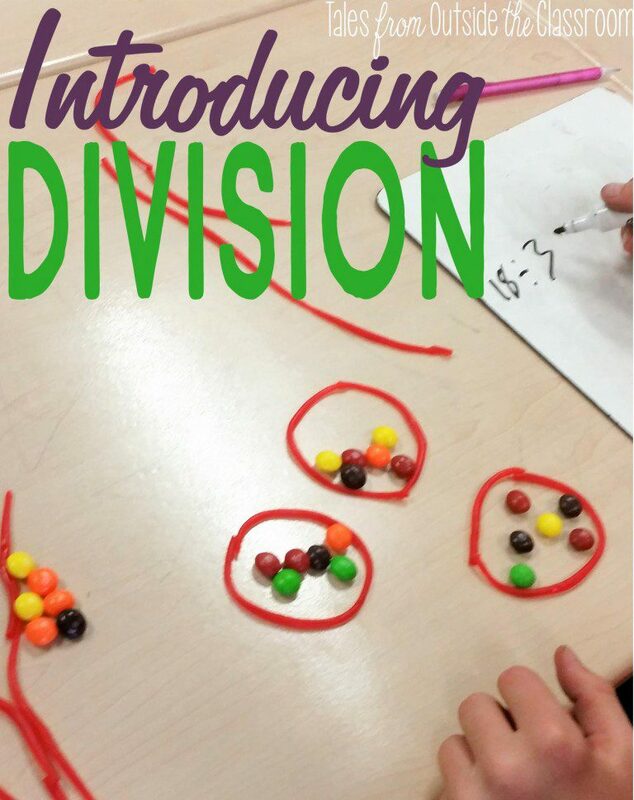 Then I explained that division is when we know the total number of objects (like the Skittles in their hand), and the number of groups the objects are going to be divided into (like the Twizzlers they have laid out). I then told them to divide their Skittles equally between the groups to find how many belonged in each group. Then, we worked through various problems representing the division equation using our Skittles. I showed students an equation and then walked them through how many Skittles to place in their hand and how many groups to create based on the equation. I also explained to students that division can also mean that we know the number in each group instead of the number of groups, and we explored those problems as well. Once students understood how to solve a division equation by representing it with manipulatives, I passed out a sheet to give them a bit of independent practice. Of course, after they were done, they got to eat their Skittles. Success! The next day we used my Mustache You the Equation: Pictures & Arrays task cards to practice writing division equations from picture representations. These are the same task cards that we used to practice multiplication. I love that I can use the task cards multiple times throughout the year. I do not include what type of equations should be written in the directions, so that they can be used during either unit. Because there are two sets of task cards, and each set has 28 cards, we worked through 4 of the cards together as our quick review before I sent students to do a Solve the Room. To check out these task cards in my TpT store, click here. On Wednesday I used my Mustache You the Equation: Multiplication & Division on a Number Line Task Cards as our lesson and guided/independent practice. I think students can seem to grasp division on a number line a bit better than multiplication, from my experience, so I like walking students through this lesson. Once we’ve practiced this a bit, I’ve found that students have a more solid understanding of multiplication with number lines. Again, these are the same task cards we used in the multiplication unit so I loved not having to prep anything new. To see them in my TpT store, click here. By Thursday, we were ready to start exploring multiplication and division together. We had spent all week talking about the terms we would use (total number of objects, number of groups, etc). I LOVE these Multiplication & Division Scenario Tables Task Cards. They were the first product I created in this series as I needed a way for my students to practice recognizing when something was multiplication and when something was division in real life situations. Often, when students see story problems, they trip up on the wordings. This allows us to practice the skill before we get to word problems. It’s so much less intimidating to students. We reviewed what we had learned about division during the week, and then worked through 6 problems together. Then I sent students to do an independent practice by doing Scoot with these task cards. Have I mentioned I LOVE task cards? On Friday, we began looking at story problems for real world application of the standards. For things like this, I often use the free available problems on IXL.com to display and work through story problems together. I alternate between division and multiplication equations by having separate tabs open and flipping back and forth between them. I love the simplicity of these problems as students’ first practice with the two in word problems. All of the task cards I’ve shown in this post, plus two more sets, are part of my Multiplication & Division Task Cards Bundle. I use these task cards in both my multiplication and division units. Then, because there’s two sets on each product, I use them throughout the year as a review. I love taking task cards from each set and putting them together to give my kids continued practice. So numbers 1-6 will be from pictures, 7-12 will be from number lines, etc. Or I have students do the even numbered problems as the represented multiplication equation and odd numbered problems as the division equation. There’s so many ways to reuse these throughout the year to keep students practicing and mastering multiplication and division and building their fact fluency. As we continue working with multiplication and division we’ll work on building fact fluency and on recognizing and working with all 4 operations as well as multi step story problems. We’ll be working through many of the products below throughout the year. Click on the images to head to my TpT store to see more about each of them and to see if they’re a good fit for you and your students.